We aim to ensure that those children who engage with Amnesty International UK receive the protection and support they need if they are at risk of abuse or harm. This procedure provides clear direction to staff and volunteers at Amnesty International UK if they have concerns that a child is in need of protection. This procedure applies to any paid member of staff or volunteer who may be concerned about the safety and protection of a child or young person under the age of 18.
a child might make a direct disclosure about him or herself. a child might make a direct disclosure about another child. a child might offer information that is worrying but not a direct disclosure. a member of staff or volunteer might be concerned about a child’s appearance or behaviour or about the behaviour of a parent, carer or Amnesty staff member or volunteer towards a child. a parent might offer information about a child that is worrying but not a direct disclosure. Child abuse is significant harm caused to any child (including third party abuse) by neglect, physical injury, sexual abuse or emotional damage. Sometimes there are no obvious physical signs of sexual abuse, and a physician must examine the child to confirm the abuse. You can’t tell by looking at a person whether they are an abuser – they don’t appear different from the rest of the society. Abusers come from all positions of society and all professions. Abuse of children may sometimes be carried by strangers but it is much more common that the abuser is known to the child and is in a position of trust and /or authority. It is not only adults who abuse children; children may suffer abuse from other children and young people. Some adults, including professionals, who manipulate themselves into positions of trust where they can exploit children and young people, emotionally and sexually. Some adults, including professionals, who by behaving inappropriately towards children and young people can cause them to suffer physical or emotional harm. It is very important to draw the distinction between sexual abuse and the other ways in which children may suffer harm – the reasons for the sexual abuse of children and young people are very different from the reasons why people physically abuse or neglect them. Tell him/her that you now have to do what you can to keep him/her (the child who is the subject of the allegation) safe. Give the child the ChildLine phone number: 0800 1111. If the first aider is not available, use any first aid knowledge that you may have yourself to help the child. You also need to contact your supervisor/manager or designated safeguarding officer for children to let them know what is happening. The parent’s right to know (unless this would place the child or someone else in danger or would interfere with a criminal investigation). The impact of telling or not telling the parent. The current assessment of the risk to the child and the source of that risk. 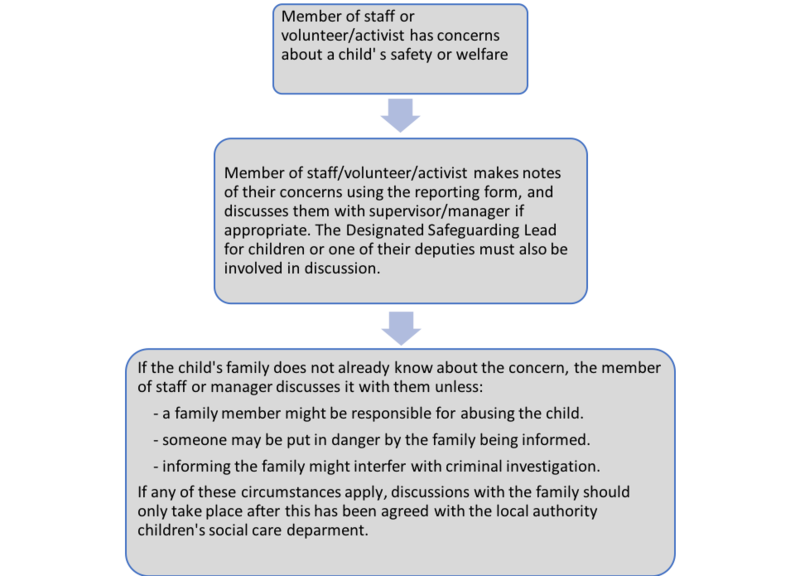 Use the safeguarding incident reporting form to record the concern and how it is dealt with. The relevant sections of the form should be completed and signed at each stage of the procedure. It can be used to forward information to the statutory protection authorities if a referral to them is needed. The form should be signed and dated by all those involved in its completion and kept confidentially on the child’s file. The name of the person making the notes should be written alongside the entry. If a child is in need of emergency medical attention or in immediate danger, follow the procedure set out in the section above on helping a child in immediate danger or in need of emergency medical attention. You should then take the steps set out in the flowchart above to ensure the concern is dealt with. Who is responsible for this procedure?